7 Fun Toy Ideas for Your Busy Toddler – Blocks, Playsets, Music – What Will It Be? For parents, one of the most wonderful phases in a child’s life is the toddler years (1-3 year old). Not only do they develop many new skills during this time, it is also when their personalities begin to show. As the parent of a toddler, you need to make sure that your child has everything they need to be healthy and happy. One thing you will need to buy is toys as these play an important role in the toddler years. Firstly, they are a source of fun and entertainment for your toddler. Secondly, they are a fantastic resource for supporting many areas of your toddler’s development. The difficult part is deciding which toys are best to buy for a toddler. Here are some ideas for inspiration. Some of the best educational toys for toddlers are those that are interactive. 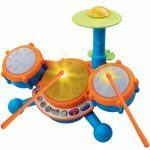 There is a fantastic variety of cool toys for toddlers that read, play music, speak, make sounds, move or any other interactive elements. Children find these exciting and the interactions add another level to their play. There are many reasons why interactive toys are a good choice for toddlers. The first is that they are very sensory toys. This means they encourage children to use several senses at one time during their play. Secondly, interactive toys offer a lot more fun to toddlers than toys with no interactive elements. They will hold their interest for longer periods and offer more ways for a child to play with the toy. This means your toddler will get more use out of the toy and it will not be discarded into the toy box when your child becomes bored. 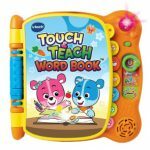 Finally, interactive toys are a wonderful aid to learning for children and this can support many areas of their development. Just some of the skills that toddlers can develop while playing with interactive toys include fine and gross motor skills, speech and language, numeracy, communication and the ability to use their own initiative. 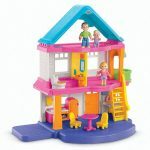 Regardless of whether you have boys or girls, or both; dollhouses are the perfect toy for young children. They can provide hours of fun as children can play with a dollhouse in a variety of different ways. Setting up the house with the furniture and rearranging it as they wish is just the start of the fun. Next, a child will spend hours creating different scenarios and allocating roles to their dolls. Often, the scenes that children act out are a reflection of their personal experiences in life. Even at a young age, children are aware of the different roles that people they know play in their life and have a basic understanding of different social situations. 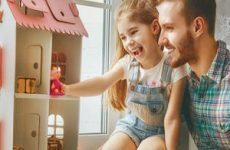 A dollhouse is about so much more than fun as they are a great tool for helping your toddler to enhance their skills and to meet important developmental milestones. These little houses are particularly good for developing social and communication skills. For example, they learn about taking turns in conversation. When playing with a doll house with other children, a toddler will learn about listening, sharing ideas, sharing toys and working as part of a team. Furthermore, they are an excellent way of encouraging creativity and imagination in your child. Play sets are an excellent alternative to dollhouses for toddlers and they provide the same types of play opportunities. They spark the imagination and creativity of your child and can be used to create role-play scenarios. Again, these will support various areas of development including communication, social skills, and fine motor skills. If you are worried that dollhouses are aimed more at girls, then play sets are a good gender-neutral option. There is a vast range of play set options available, so you can buy something that suits your child’s personality and interests. 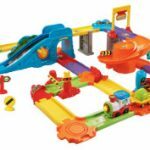 Just some play sets you may see include train sets, castles, fire stations, garages with multi-story parking lots and kitchen sets. As building blocks are one of the cheapest toys you can buy for toddlers, these are one of the best options for parents on a budget. Building blocks are usually sturdy and colorful. Not only do children enjoy brightly colored toys, but they are also a clever way of introducing the names of color to toddlers. 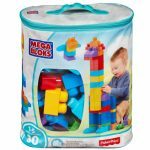 Although you may see building blocks as a toy that is solely aimed at having some creative fun, they also provide educational opportunities and can support a toddler’s development in several ways. One of the main ways you can use the blocks in an educational capacity is to use them to support early numeracy development by introducing basic mathematical concepts, such as counting, addition, subtraction, and shape. Most children love music. Anything that plays music will keep them captivated and entertained. Musical instruments can stimulate the senses of sight, sound and touch. The look on a toddler’s face when they first realize the connection between their movements and the sounds coming from an instrument is a joy to behold. You can buy relatively cheap sets of musical instruments that each make different sounds. These often include a tambourine, maracas and a drum. If you have more than one child, then a musical set is something they can play with together. Alternatively, you can join your toddler’s band for some fun bonding time together. Many parents have a love-hate relationship with Play-Doh. On the one hand, it is a cheap, colorful and fun toy that will inspire creativity in your child. On the other hand, toddlers tend to make a mess when playing with their Play-Doh and it is a nightmare if it gets trampled into your carpet. 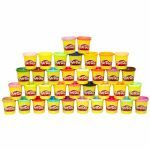 However, if you can stand the mess or make provisions to minimize how far this play putty will spread, then your child will have fantastic fun playing with Play-Doh. This colorful and tactile toy will stimulate the senses of touch and sight when a toddler is playing. It is also one of the cheapest ways to let your child’s creativity flow. Although you can buy Play-Doh sets that include tools and instruments for a child to make different designs, you can easily improvise at home. Kitchen utensils are a good option as a toddler can use them to make different shapes and designs with their Play-Doh. Obviously, you need to avoid the sharp kitchen utensils, but spatulas, rolling pins, spoons and plastic biscuit cutters are perfect. Here is a great play-doh recipe for all the do-it-yourselfers! One of the greatest developmental milestones your child will reach as they transition from a baby to a toddler is they will begin to walk. However, there are many stages in the process between taking their first steps and having the ability to run confidently across a room. During this process, they must learn to balance, coordinate their movements and build their self-confidence. A walker is a great aid in developing each of these skills and is also a fun toy for your child to play with. There are many different styles of walkers on the market right now, each with a range of features for your child to enjoy. Therefore, not only will a walker help your toddler to become steady on their feet, they will have plenty of fun with their walking aid. Some of the features you will often see on walkers include music, sounds, moving parts and buttons to press. Your toddler can play with these while they are standing, sitting or walking. No matter which toys you choose for your toddler, safety should always be your paramount concern. Many toys give guidance regarding the age of a child for which the toy is aimed. For example, it may say that it is only suitable for children of three years and over. You should take this advice seriously as it is there for a reason. In most cases, this age is stated as there are small parts contained in the toy. These can pose a choking hazard to younger children. Therefore, they are not suitable for toddlers. 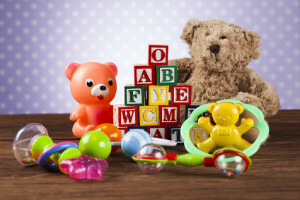 Although toys are predominantly about a child having fun and being entertained, many of the toys for toddlers also have an educational purpose and will support the development of your child. 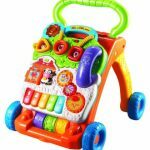 There is a vast range of toys available that are aimed at toddlers, so there is something to suit all budgets and preferences. Giving a toddler a variety of toys that each offer a different play experience and promote the development of different skills is the best way to keep your child entertained while also supporting their development during this important phase in their life.